Tiger Woods is used to facing challenges on the golf course, but now he is navigating a public relations minefield. (CNN) -- From the time he putted a golf ball at the age of 2 on "The Mike Douglas Show," Tiger Woods has been a golden child. While athletes in different professions dealt with doping scandals and other controversies, Woods continued to do what he did best: dominate the field of professional golf and rake in endorsements. But it is that squeaky-clean image, and the tightly controlled persona Woods has cultivated over the course of his career, that experts say is fueling speculation and interest in the circumstances surrounding his recent car accident. Publicist and crisis communications expert Howard Bragman said Woods' strategy of refusing to speak out is not working. "It's not working by the measure of your goal, and your goal is to make the story go away," Bragman said. "His not speaking to the press has become the story, and that's the last thing you want." Bragman said that means the tabloids can take the lead on the story rather than Woods getting out in front of it and controlling the flow of information. By his seeming evasive, Bragman noted, the appetite for details is heightened. "We see him on Sundays, wearing red, holding trophies, but I don't think we really know that much about him, which is an anomaly in the world we live in right now with everyone knowing every little detail about Lindsay Lohan, Britney Spears and fill-in-the-blank," said Rick Ellington, managing editor of Sports Business Daily. "I think [the story] has mushroomed because Tiger is notoriously private and keeps everything to himself, except what he wants to get out." The golfing phenom appears to not want to reveal anything regarding what led up to a single-vehicle accident in his posh neighborhood near Orlando, Florida, where according to a police accident report Woods sustained minor injuries. Law enforcement officials -- who said Tuesday that he would receive a careless driving citation -- had tried unsuccessfully to speak with Woods and his wife about the accident, in which he pulled out of his driveway in a 2009 Cadillac SUV and struck a fire hydrant, then a tree. Speculation about what led up to the accident has run rampant among fans. Woods' wife, Elin Nordegren, told police she used a golf club to break out a rear window of the vehicle and then pulled Woods from the SUV after she heard the crash from inside their home. For his part, Woods has called his wife's actions "courageous" and insisted that he wants to keep the matter private. Sports journalist and essayist Jim Huber, who has known Woods for 12 years, said it's hard to fathom the golfer being embroiled in controversy. "As close as he has allowed me to get, I have never heard an inkling to belie the fact that he has led anything other than an exemplary life," said Huber, a reporter and essayist for CNN's sister network TNT, who formerly hosted sports shows for CNN. "He values family life." Woods also values his privacy, Huber said, and has an inner circle of very savvy advisers. How fans and the public react to the pro golfer will be determined by what happens in the days and weeks to come, Huber said. "It's going to be a critical time," Huber said. "The fact that he's gone into hiding, I don't know if it's going to help or if it's going to continue to fuel the rumor mill." Bragman, who is the chairman of media company Fifteen Minutes -- whose client roster includes entertainers such as Stevie Wonder and athletes including golfer Rosie Jones and WNBA player Sheryl Swoopes -- said Woods' wholesome image may also mean that neither he nor his team was prepared for the accident's fallout. Ellington, whose publication covers the business side of sports, said that although some observers think Woods needs to say something to quell the rumors, his strategy of silence may also have value. "The other train of thought is that by staying quiet, he can't possibly open himself up to more questioning or any more salacious headlines," Ellington said. "That's actually what he's done for most of his career. He's being very good managing what gets out and what doesn't, so he may be going on the assumption that that has worked before, so it will work now." Ellington said it is too early to tell whether this incident will have a lasting effect on Woods' career. The initial reaction from sponsors such as Nike has been supportive. If more scandalous details emerge, that could change, Ellington said. But with the herculean focus Woods has as a golfer, Ellington said, it seems highly unlikely that he will let what happened throw off his game. That championship mentality is also why the story has taken on a life of its own, he said. 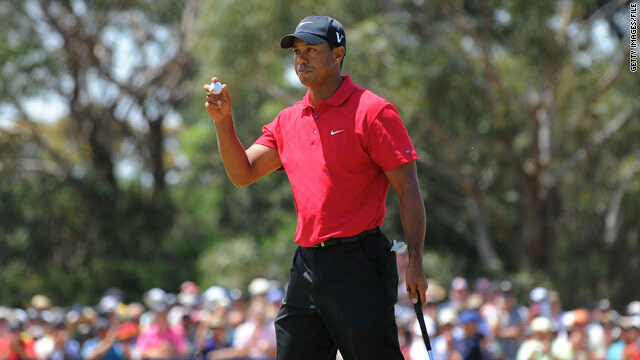 "[Woods] is easily one of the most recognizable athletes, not just in the United States but worldwide," Ellington said. "If this was a story about Phil Mickelson instead of Tiger Woods, I don't think it would be getting as much press as it has." Why is Tiger Woods silent?